Problem-Solving Challenges. Supporting Professionals. Celebrating Progress. Sharing Expertise. Online pre-registration is now closed for the August 6, 2016 Food Allergy & Anaphylaxis Michigan Conference. Adult walk-in registrants are still welcome to attend! Plan to arrive at The Kensington Hotel in Ann Arbor, MI at 7:30am and you will be directed to walk-in registration. However, you are not guaranteed an attendee folder and can return to the check-in table during mid-morning break to see if any folders are available after pre-registrants are checked-in. Please see information below for attendee reminders and updates on continuing education credits. Individuals from states other than Michigan are welcome to attend. The focus of conference content will be for healthcare professionals but others are welcome to attend. Please see conference page for more information. This conference is for adults only. Admission is free because of generous support by Food Allergy Research & Education and in-kind donors. Lunch will not be provided. There will be a mid-morning break with beverages. This event may include food allergy friendly products. However, if you have diagnosed food allergies, please remember to read all ingredient labels. Please consume any product samples off-site at home. Please refrain from wearing perfume or cologne out of courtesy to others with these sensitivities. Exhibit tables open at 7:30am EDT. Representatives from organizations and companies will display information about their programs, services and/or products for those managing food allergies. The Grande Ballroom will be air-conditioned at a level pre-set by the hotel therefore please consider bringing a sweater if you get cold easily in air-conditioned settings. Conference content focuses on IgE mediated food allergy with risk for anaphylaxis and not other forms of adverse reactions to foods such as food intolerance. This program applies to the Michigan Board of Nursing rule 2(l) and reflects 4 hours of professional continuing education credit. A continuing education credit documentation certificate will be given upon program and RN evaluation form completion. If you are from another state, please check with your own state nursing board to see if the conference certificate will be recognized. Attendance at the entire conference and submission of your completed RN specific evaluation form is required for the certificate. There is no admission fee for this program. This program has been reviewed and is approved by the Michigan Academy of Nutrition & Dietetics for 4 hours of continuing professional education credits. A certificate for 4 CPEs will be given upon program and RD specific evaluation form completion. Please be prepared to provide your full name and email at conference check-in. 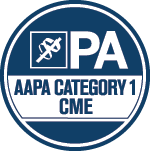 This program has been reviewed and is approved for a maximum of 4.00 AAPA Category 1 CME credits by the PA Review Panel of the American Academy of Physician Assistants (AAPA). PAs should claim only those hours actually spent participating in the CME activity. This program was planned in accordance with AAPA's CME Standards for Live Programs and for Commercial Support of Live Programs. A CME certificate will be given upon program and PA evaluation form completion. ﻿﻿Please be prepared to provide your full name and email at conference check-in. Certificates of attendance will be available upon program and general evaluation completion. Attendance at the entire conference and submission of your completed general evaluation form is required for the certificate. Click for conference overview and objectives. Click for conference speakers and planners. Click for conference location, lodging, map and directions. Click for conference sponsors and exhibitors. This project was made possible through a community award from Food Allergy Research & Education (FARE). Please Note: This website is best viewed on desktop as it is not optimized for mobile phone viewing. Click icon to reach FAAMA Facebook page. Content shared through the FAAMA website, programs, and other forms of communication is for general informational purposes only. It does not replace personalized patient education, healthcare and medical advice from the nurses, dieticians and physicians on your clinical team. This website and any communication via FAAMA or related programs does not constitute a patient/client to nurse/dietician/physician/attorney relationship between any of the professionals serving on the FAAMA leadership team or as consultants, with website users or FAAMA members. The interdisciplinary credentialed professional leadership team, the consultants and the members of the design team are generously sharing their time as a public service to support the FAAMA mission aiming to improve conditions for those managing life-threatening food allergies in Michigan. Please direct any questions about specific confidential personal healthcare and/or verify information you received through FAAMA with your team of healthcare providers. Information and opinions shared by the FAAMA leadership team and consultants through its programs, website, social media outlets and/or other forms of communication does not necessarily reflect that of their employers or work setting colleagues nor is it intended to be an advertisement for their practices, places of employment or associated organizations. School settings and policies may vary. Please direct any questions about specific personal school health issues and/or verify information received through FAAMA with your school nurse, school administrator and/or legal counsel. No FAAMA website content or that of other forms of communication should be republished unless written permission is granted. Content copyright © 2015 - 2019, Food Allergy & Anaphylaxis Michigan Association. All rights reserved.